Los Angeles is not a city of dreamers - it's a city of makers. It's a city unafraid of risk, and one that embraces and cultivates creativity. So how is L.A. reinventing itself as an entrepreneur's paradise? Uninhibited. Fun. Diverse. New. Alternative. Possibility. Sunshine. This is the L.A. creative scene – summed up by the people in it. L.A. is a city where all forms of creativity collide, people make things happen and big risks are taken. It’s a city of culture – art, advertising, fashion, food, entertainment, sport and technology. That is why it has produced so many start-ups – particularly consumer brands such as The Honest Co. and Dollar Shave Club. And it is also why the region’s content and entertainment industries generate $55.9bn (£43.9bn) annually, according to the Los Angeles Economic Development Corporation. 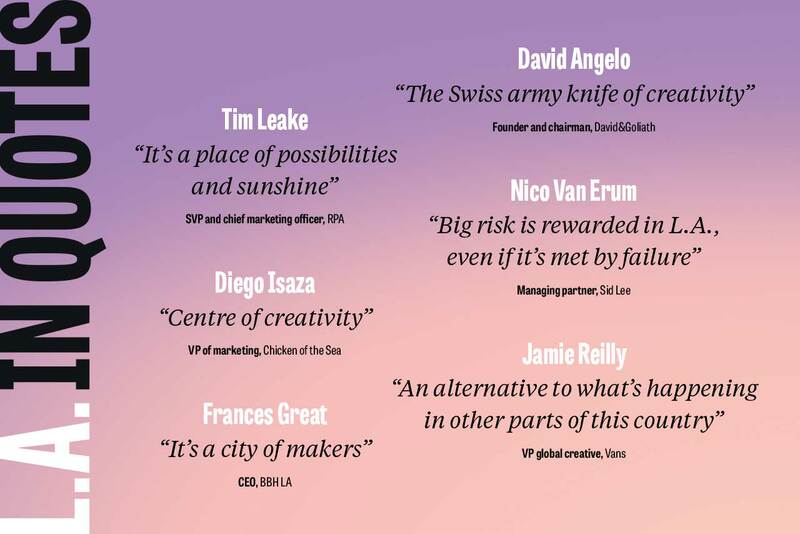 So what makes the city so attractive to brands? Campaign US editor Lindsay Stein hosted a candid conversation in Santa Monica, L.A., to find out how culture meets creativity and what challenges and opportunities face brands and agencies alike. What attracts brands, advertisers and start-ups to L.A? L.A. offers something new, explains VP global creative of Vans, Jamie Reilly: "It is now and has always been an alternative to what’s happening in other parts of the country – people come here to try to create new things." It is hard to build a brand anywhere, says Anomaly LA’s CEO and partner Jiah Choi: "But the luxury you have in L.A. is the intersection of music, media, entertainment, sport and technology. You can have success outside of this city, but if you’re a creative you want to be in the centre of it all." David&Goliath founder David Angelo believes the people in L.A. make it stand out: "California has always been a state of opportunity. And more and more people have migrated to Los Angeles, bringing their energy and a belief that everything is possible. This is the foundation for great collaboration." Depeche Mode’s band manager Alex Pollock believes L.A. has been dismissed for years for being a "city of dreamers with no substance", but things have changed: "It’s now a city recognised for being entrepreneurial." Tai Foster, VP of brand marketing at start-up Art of Sport, says L.A. is the clear choice for a new business to thrive: "Where else are start-ups going to boom? L.A. is a big, metro city with diversity and immense talent." It is a city of makers, explains BBH LA CEO Frances Great: "There is a maker culture and mindset that lends itself beautifully to start-up culture. You’re surrounded by like-minded people." What are the challenges and opportunities in L.A? Resisting the irrelevant is a challenge and a recipe for success, explains Angelo: "Most people get excited by trends, media channels or celebrities but you really have to start with who you are – and your values. In the past, brands have jumped to work with Lady Gaga or another star but it hasn’t got anything to do with their brand so it works for no one. You must have the restraint not to jump at it." 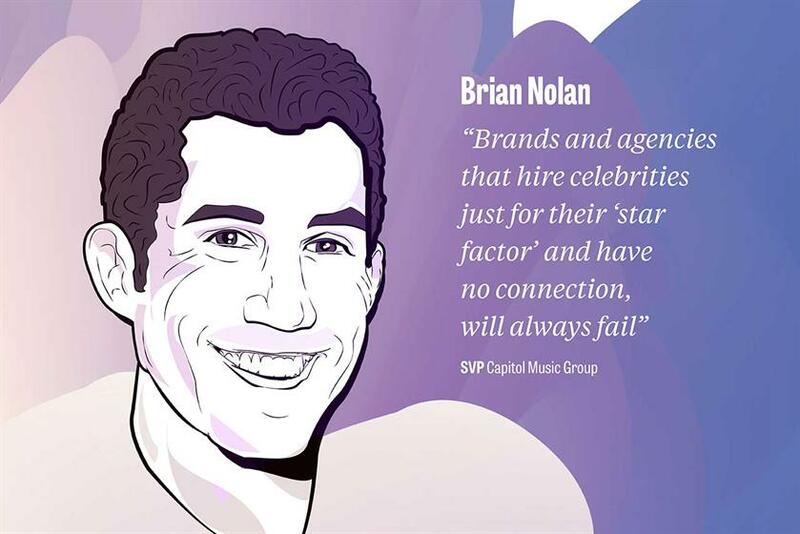 Brian Nolan, SVP at Capitol Music Group, adds that brands and agencies that hire celebrities just for their "star factor" and have no connection will always fail. Foster believes the biggest challenge for start-ups is pace: "The kind of push and pull in start-ups is that you grow or you die. You’re literally building the plane and flying at the same time." Angelo suggests brands and agencies must act like start-ups: "Regardless of size, everyone needs to have a start-up mentality – everyone needs a point of difference. Big businesses go out of business if they lose this mentality. No one at the table is saying they are totally okay with the results they got last year – whether they are a brand or agency. We have this relaxed environment and culture but we know we need to succeed in business." 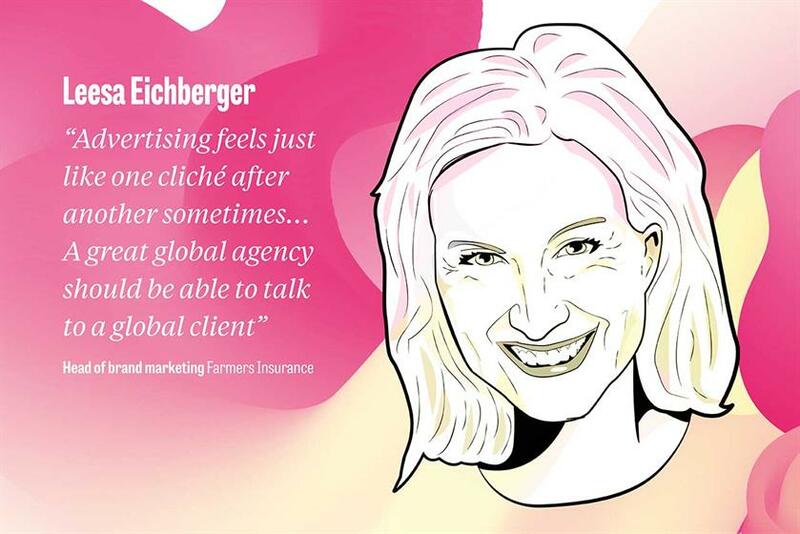 Leesa Eichberger, head of brand marketing at Farmers Insurance, explains that standing out – on a global level – is a challenge for brands: "Advertising feels like just one cliché after another sometimes and the ad model can be quite segregated. A great global agency should be able to talk to a global client. "Insurance is a category people don’t like and have low engagement with, so the creative RPA builds for us has to really break through – and it does. People say: ‘ I can’t wait for your next ad’, and people don’t say that about advertising, so that’s what we aim for," she adds. 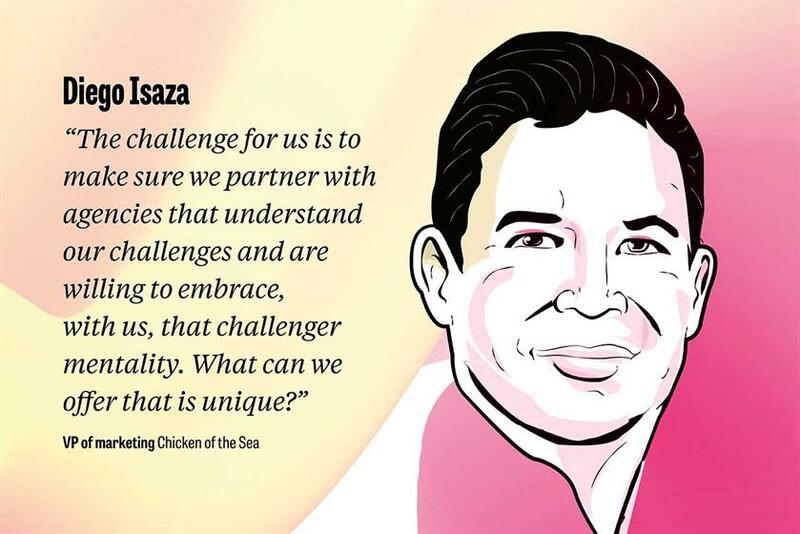 Chicken of the Sea marketing VP Diego Isaza believes that the challenge for brands is to offer something that is actually unique: "The challenge for us is to make sure that we partner with agencies that understand our challenges and are willing to embrace, with us, that challenger mentality. What can we off er that is unique?" Los Angeles Rams EVP of business operations, Jamie Reigle, explains how his American football brand has an interesting challenge – after moving back to the city 18 months ago – to rebuild: "We realise you need to fix the core product and that’s where our efforts are. We are taking risks as we knew we had to in this market to have an impact." Big risk is rewarded in L.A. – even if it is met with failure – and that is important for brands, says Nico Van Erum, managing partner at Sid Lee. He cites Los Angeles Rams as a brand taking risks and reaping the benefits. "Risk is looked up to here, due to its progressive culture," he says. "And that’s key to attracting clients. What the Los Angeles Rams is doing wouldn’t haven’t worked in other cities." How does L.A attract and keep top talent? L.A. wins talent due to its culture, says Reigle: "I have lived all over, from London to Hong Kong – and there is really good creative talent here [L.A.]. We’ve tried to focus on building great talent on the football side, as well as the brand side." Anomaly has just opened its L.A. office, explains Choi, and the agency has been surprised at how easy it has been to attract talent: "I thought recruiting people outside L.A. would be the most challenging thing but people want to come here. L.A. is such a hotbed of creativity and culture. People work hard but there’s time to enjoy life also – it’s allowed and expected." Great explains the type of talent her agency needs is changing to become more flexible, and there is a much bigger freelance pull: "We’re not all necessarily sitting in the office together from 9-6 any more," she says. How can brands break through the clutter? Building brand fans starts with taking risks, believes Pollock, who cites a campaign that saw Depeche Mode give fans access to its Facebook account for a year, in collaboration with BBH LA. With no advertising spend but an incredibly loyal and die-hard fanbase, Pollock says that BBH enabled the fans to tell the story: "There’s little more powerful than going to a concert and being in the crowd, around thousands of people." Great explains that the fan Facebook takeover helped to show why the brand matters: "There was an element of risk in it but it was authentic and made sense." You have to give people an experience if you want to be remembered, suggests Van Erum: "Today so many clients are asking for experiences, not advertising. Millennials remember experiences more than anything else and that’s why clients are spending millions on them. We worked with Absolut several years ago and the experience we created was filmed and became the ad. It was experience first." For Anomaly, you have to start with the right mindset: "We’re trying to not be a traditional agency – we’re successfully bringing ideas in from the outside," explains Choi. Advertising has always been about storytelling and it always will be, says Tim Leake, SVP and chief marketing officer at RPA: "What can you do that will inspire someone?" Bringing people together – off the app and into real life – is important for dating app Bumble, explains the brand’s director of marketing, Shaden Abboushi: "We’ve created pop-ups – one in Los Angeles and one in New York – and encourage people to meet and hang out there. They work well because people don’t forget the way you make them feel and if they have a great experience with a brand they are going to go and tell everyone." Brands must realise that consumers are more concerned with what brands are doing – "who is authentic and who gets you, not necessarily what you’re selling", says Angelo. Go for it, enthuses Anomaly’s Choi: "If you have the dream and you put in the work, L.A. is somewhere where you can make something of it. It doesn’t matter where you come from or how much money you have, it’s an open society."